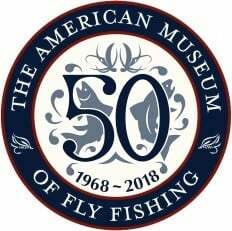 The American Museum of Fly Fishing will celebrate its 50th anniversary in 2018. To mark this milestone, admission to the museum will be free to the public every Friday through 2018. Manchester, Vermont (March 22, 2018) – The American Museum of Fly Fishing is celebrating its 50th anniversary in 2018. Admission is free to the public every Friday this year as AMFF marks this milestone. This summer the Museum will open The Selch-Bakwin Fly Room, which will showcase the rarest flies from some of the most notable names in the history of fly tying—including Theodore Gordon, Preston Jennings, George LaBranche, Edward Hewitt, Megan Boyd, Lee Wulff, and Helen Shaw. AMFF also houses the oldest documented flies in existence, tied in 1789 in England and Scotland. Additionally, On Fly in the Salt: American Saltwater Fishing from the Surf to the Flats will open in preview in our Leigh H. Perkins Gallery before it begins a multi-city tour.